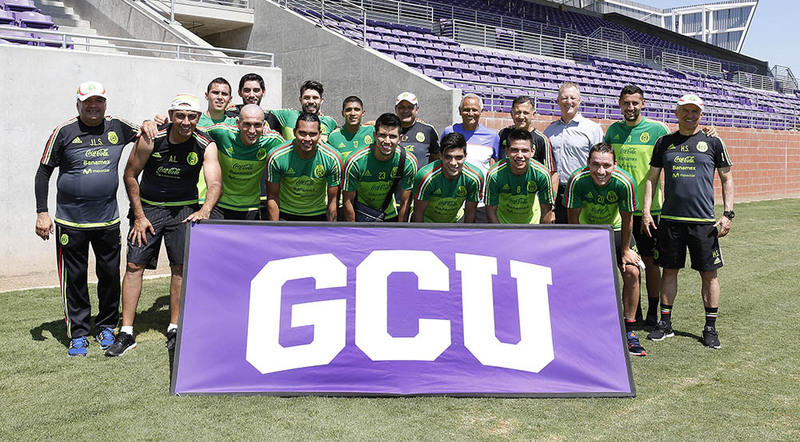 Grand Canyon University’s new soccer stadium proved its potential Monday when it welcomed the Mexico national soccer team to use the field for the first time. There’s a lot of activity at the new soccer stadium in the heart of the Grand Canyon University campus. By Thursday evening of last week, the grass had been mowed in stripes, the soccer nets had gone up and a GCU banner wrapped the fencing along the stadium’s east end. Friday, the fences around the stadium had been covered for privacy, and word around campus was that arguably the most popular soccer team in the U.S. — Mexico — would be visiting soon. And then it happened Monday morning when the Mexican team walked onto the new field, ready to practice. It was an exciting day for construction workers who watched from a distance as the Mexican team practiced. “Talk about an event,” GCU men’s soccer coach Schellas Hyndman said after shaking hands with Mexico coach Juan Carlos Osorio. Initially, both Mexico and Uruguay were scheduled to practice at the new field last week before their Copa America Centenario opener Sunday at University of Phoenix Stadium in Glendale. However, they canceled their request because of an excessive heat warning. Monday’s visit came after Mexico showed its title credentials with a 3-1 victory over Uruguay. The tournament, which celebrates the 100th anniversary of the historic South American international men’s association soccer championship, is being held in the United States for the first time, and Glendale is one of 10 sites. “How cool is this? We’ve got the national team of Mexico, which is currently rated as the top 16 in the world, as the first team to train on the field,” Hyndman said. 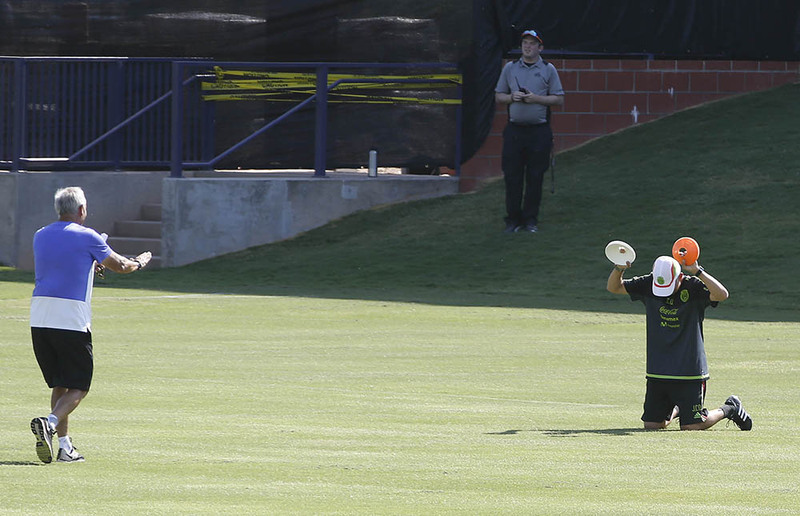 Yasser Corona (left) and Paul Aguilar of the Mexican team practice at the GCU stadium. Considering that soccer is the most popular sport in west Phoenix, Hyndman said he could not think of a better time to receive a national team. 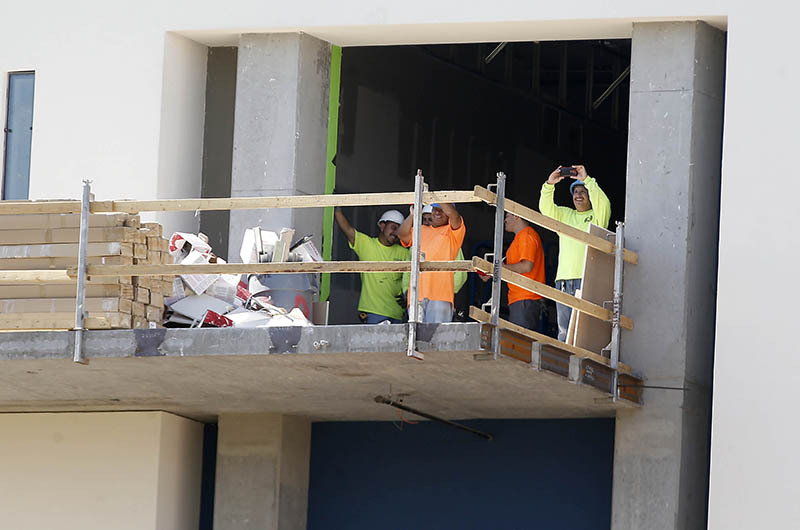 The new stadium, which has natural grass, 2,800 shaded seats and 10-foot berms to allow larger crowds, is scheduled to hold its grand opening in August. It’s no wonder the men’s soccer coach has a lot to rave about. “I really believe it’s the best college soccer stadium I’ve ever seen,” he said. The visiting soccer team thought so, too, including Guillermo Ochoa, Mexico’s goalkeeper. After a one-hour practice that included running, passing, blocking and shooting goals at GCU’s new stadium, Ochoa was impressed by the condition of the field. 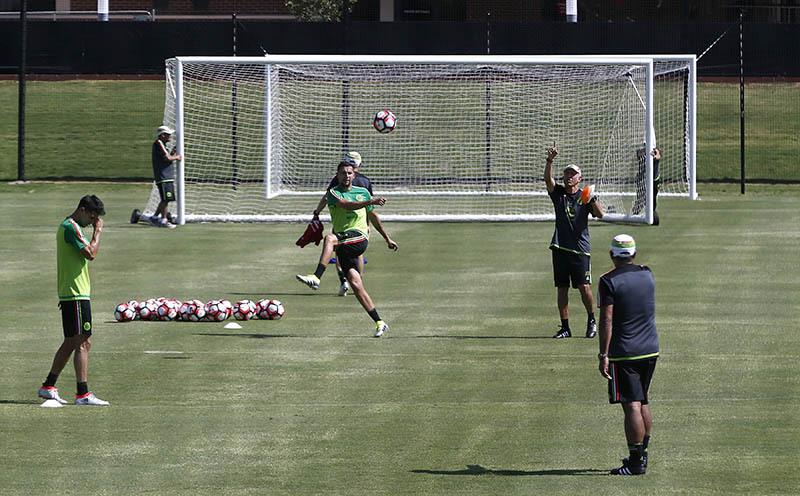 Mexico’s national soccer team prepares for its next match, Thursday in Pasadena. Ochoa also commended the huge sea of red, white and green super fans who supported their win over Uruguay. Mexico plays at a number of stadiums across the globe, but its home stadium, Estadio Azteca, has what is considered the loudest atmosphere in international soccer. Coach Hyndman and Mexico coach Juan Carlos Osorio, who coached Major League Soccer together, shared a very special reunion when Osorio got on all fours at the GCU field to show his respect. Mexico has been a regular participant in the Copa America tournament, has won more Gold Cups than any other team and consistently has finished in the top three in the tournament since it was founded. Mexico next plays Jamaica on Thursday at the Rose Bowl in Pasadena, Calif.
Great Read! So excited that some of the players from the Mexico Soccer Team were able to practice here… it was great seeing them after their victory the day before.